“The idea came froma few snatched sentences during overhead in a park. A group of teenagers was taunting a girl because she’d had seven different boyfriends in one school term. They called her names, told her she was easy and mocked the way she was dressed. When she defended herself by accusing one of the boys of having more girlfriends in a similar time period they all laughed and said that made him a player….. I watched the girl leave the park and wondered how she felt. Would she tell anyone? Where were her friends? Jenny Downham. Ellie and Mikey come from very different backgrounds. When Mikey’s sister, Karyn, claims that Ellie’s brother, Tom, has assaulted her, each of these characters wants to believe their subling and do everything they can to stand by them. Then Ellie and Mikey fall in love and they know their search for the truth will tear apart their families. Together they have to decide whether to risk everything – including their future happiness. 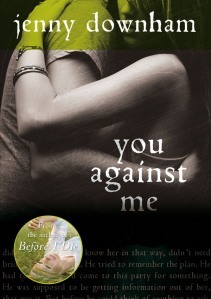 “This is a brave and unflinching novel from the bestselling author of Before I Die. It’s a book about loyalty and the choices that come with it. But above all it’s a book about love.” The Little Bookroom.